This much cool, but lots more social. So a few of months ago Duana and I arranged the first GGD Afternoon Hack. It was lots of fun if not overcrowded, so we want to have another one. 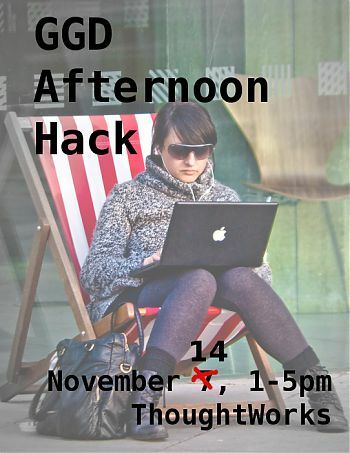 It will run from 1-5pm, at ThoughtWorks, Level 15, 303 Collins St, on Saturday the 7th14th November. We need RSVPs at Facebook or my email. GGD = Girl Geek Dinner. Since this is in the afternoon there is no dinner, but the gist is, it’s a women focused event. Men can come as the guest of female attendee if they like. So it’s just BYO laptop, and some project that you’re working on or interested in. Very simple. In case you need ideas, you could poke around the Mashup Australia site and see if you can come up with anything interesting….that competition closes a week after that, but you could go even better… mashup in an afternoon? Why not? !